The CAS procedure (PROC CAS) enables us to interact with SAS Cloud Analytic Services (CAS) from the SAS client based on the CASL (the scripting language of CAS) specification. CASL supports a variety of data types including INT, DOUBLE, STRING, TABLE, LIST, BLOB, and others. The result of a CAS action could be any of the data types mentioned above. In this article, we will use the CAS procedure to explore techniques to interact with the results produced from CAS actions. 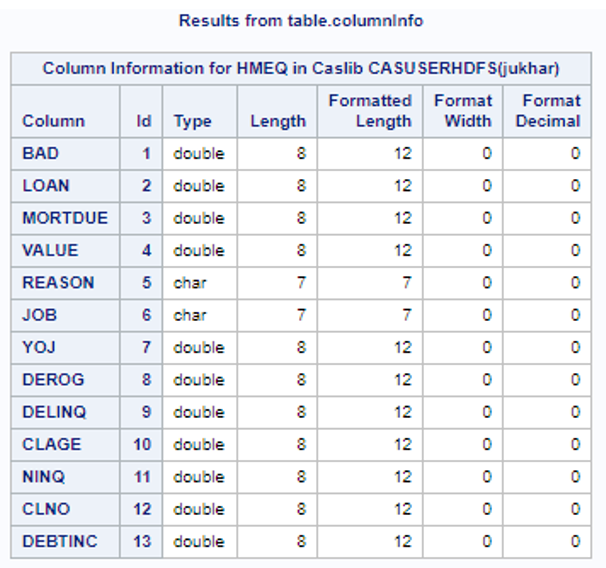 In the code above, the table called ‘HMEQ’ is a distributed in-memory CAS table that contains data about applicants who were granted credit for a certain home equity loan. The categorical binary-valued variable ‘BAD’ identifies a client who has either defaulted or repaid their home equity loan. Since PROC CAS is an interactive procedure, we can invoke multiple statements within a single run block. In the code above we have executed the COLUMNINFO action from the TABLE actionset and the SUMMARY action from the SIMPLE action set within the same run block. 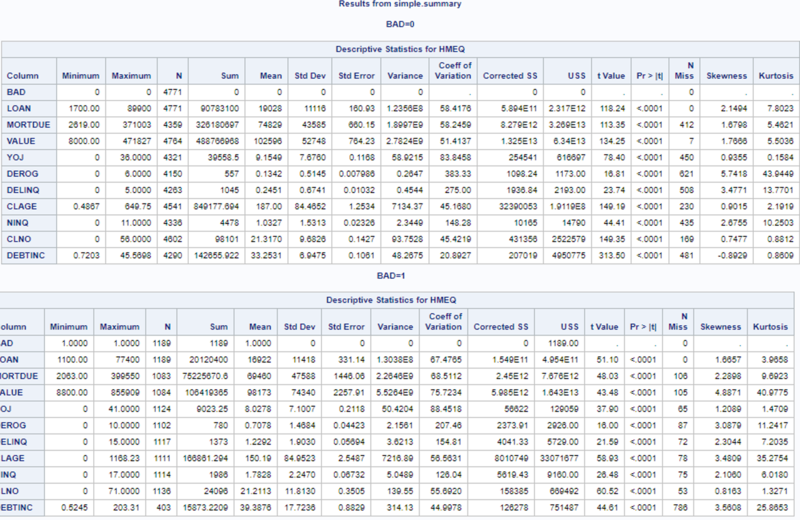 Notice that we are able to obtain a summary statistic of all the interval variables in the dataset grouped by the binary variable ‘BAD’ without having to first sort the data by that variable. Below is a snapshot of the resulting output. The result of an action could also be more complex in nature; it could be a dictionary containing dictionaries, arrays, and lists, or the result could be a list containing lists and arrays and tables etc. Therefore, it is important to understand these concepts through some simple cases. Let’s consider another example where the result is slightly more complex. In the example above, we are executing a summary using a BY group on a binary variable. 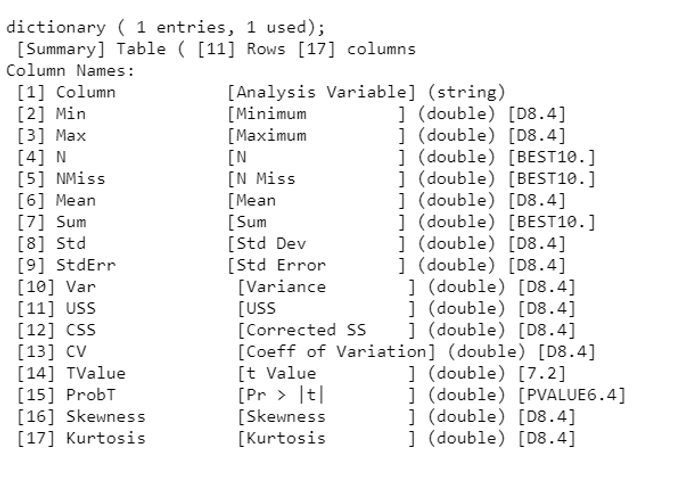 The log shows that the result in this case is a dictionary with three entries, all of which are tables. Below is a snapshot of the log file as well as the output of PRINT statement looking at the summary for the first BY group for row 3 through 5. If we are interested in saving the output of the summary action as a SAS data set (sas7bdat file), we will execute the SAVERESULT statement. 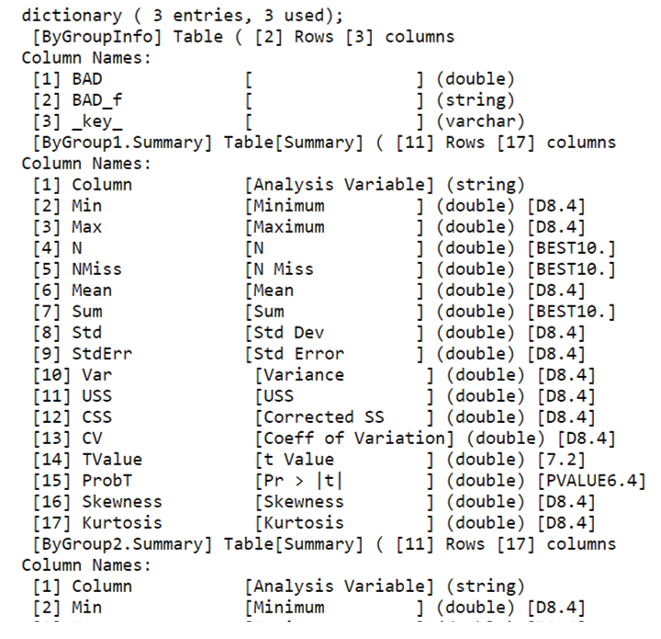 The code below saves the summary statistics of the first BY group in the work library as a SAS dataset. A helpful function we can often use is findtable. This function will search the given value for the first table it finds. In the example above, I used findtable to locate the first table produced within the dictionary, S, and save it under ‘Val,’ which is then directly invoked with SAVERESULT statement to save the output as a SAS dataset. In this post, we saw several ways of interacting with the results of a CAS action using the CAS procedure. Depending on what our end goal is, we can use any of these options to either view the results or save the data for further processing. 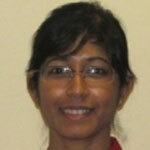 Juthika Khargharia is a analytics solutions architect at SAS within the Business Analytics Practice. She assists customers in defining their business problems and uses SAS advanced analytics solutions to help them reach their business goals and objectives. She holds a Ph.D. in Astrophysical and Planetary Sciences from University of Colorado.